St Pancras Renaissance London Hotel. Photo by Darrell Godliman. Before the 19th century, if you wanted to stay in London, your choices were to rent a house, stay at your gentleman's club, or take a room in a lodging house or coaching inn. With the arrival of the railways and the industrial revolution, people began travelling to London more frequently. Many of the railway companies started building hotels near to their stations to accommodate travellers; the resulting grand buildings were status symbols for the massive railway firms, the richest businesses in the country at the time. Brown's Hotel, which opened in 1837, is made up of 11 historic Georgian townhouses and no two of the 117 rooms are the same. Initially, it was run by James and Sarah Brown, the former valet and maid to Lord and Lady Bryon, who got hitched and set up a hotel. The Ford family took over in 1859 adding London's first public dining room, and buying the next-door St George's Hotel in 1889, combining the two hotels. It's famous for hosting a veritable who's who of Victorian writers (Oscar Wilde, Robert Louis Stevenson, Bram Stoker, Arthur Conan Doyle, and JM Barrie) as well as being the location of London's first phone call, made by one Alexander Graham Bell. It's a bit tough on Claridge's, coming second on this list. 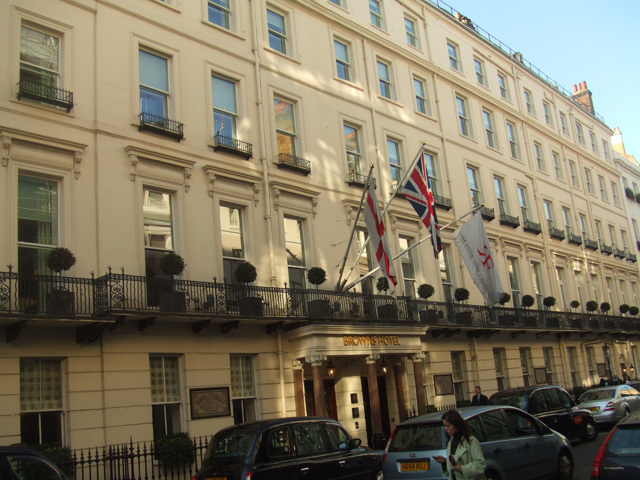 In fact there was a hotel called Mivart's established in 1812 on this site, next door to a smaller hotel owned by a Mr and Mrs Claridge; but the founding of Claridge's is only taken as the date from when the two were combined in 1854. Much of the original building was demolished and rebuilt in 1898 as the hotel we know today. Read more secrets of Claridges here. 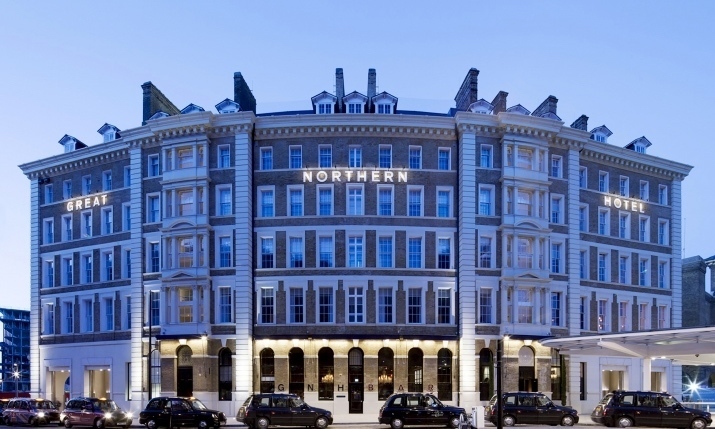 The Great Northern Hotel, which opened in 1854 in King's Cross, was London's first great railway hotel. Since the revival of King's Cross, this Grade II-listed Victorian landmark, by architect Lewis Cubitt is back, renovated and refurbished after being derelict for 12 years. 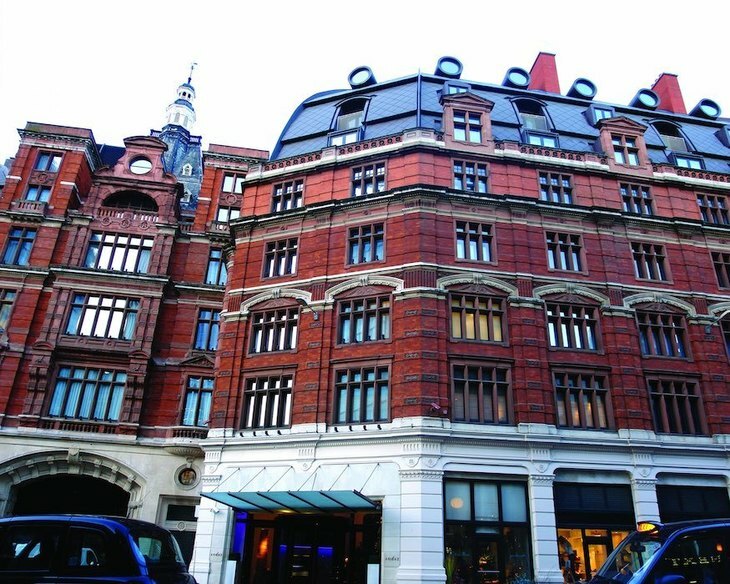 Despite its imposing frontage, the Great Northern is actually quite restrained compared to some of London's larger hotels, with just 90 rooms over its six floors. 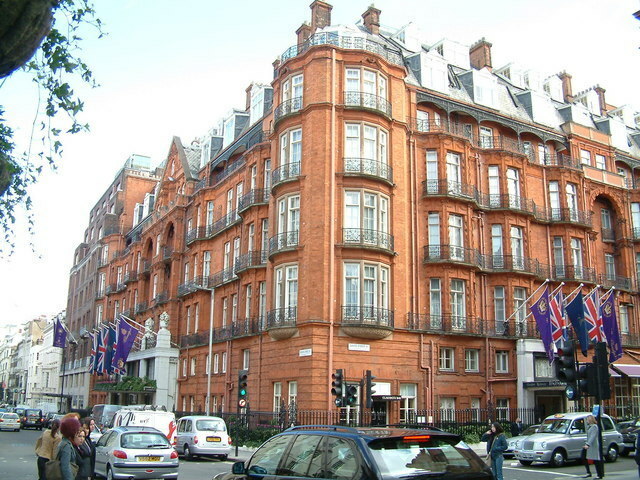 The imposing Grosvenor Hotel has stood at 101 Buckingham Palace Road since 1860. The Grosvenor Hotel on Buckingham Palace Road. The building, a Baroque interpretation of the French Renaissance style (think sculpted heads with laurel crowns; roses and plumes) is Grade-II listed. The Langham, designed by John Giles, was London's first purpose-built 'grand hotel'. It was built between 1863 and 1865 at a cost of £300,000. 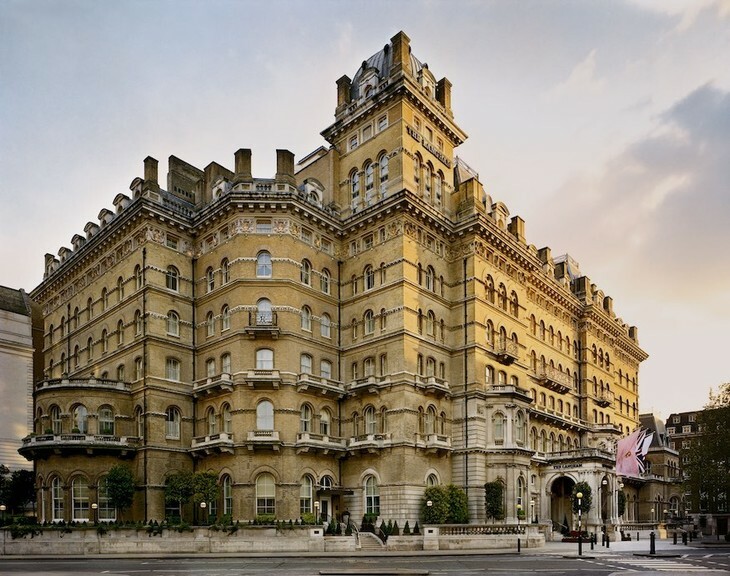 When it opened, The Langham was the largest hotel in the city, featuring 100 'water closets', 36 bathrooms and the first hydraulic lifts in England. The opening ceremony on 16 June 1865 was performed by Queen Victoria's son, the Prince of Wales. 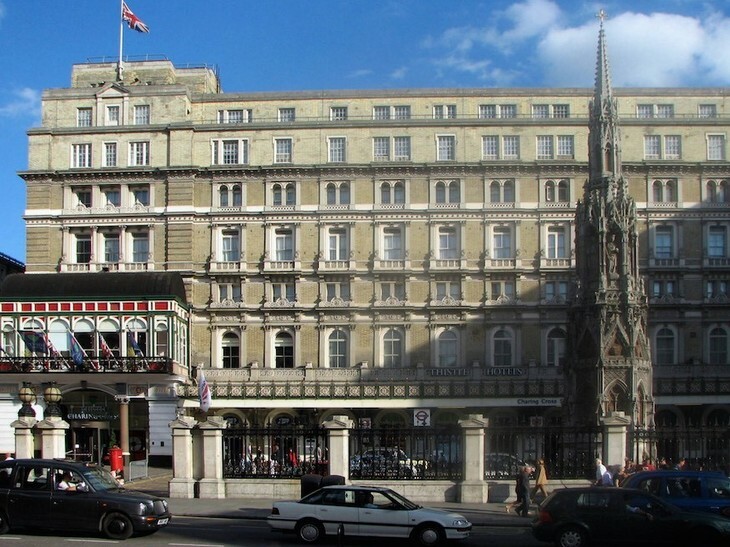 The Charing Cross Hotel, built above Charing Cross Station, was designed by architect Edward Middleton Barry, the third son of another famous architect Charles Barry, and the chap responsible for Covent Garden's Royal Opera House. Edward also designed the nearby Queen Eleanor Memorial Cross. 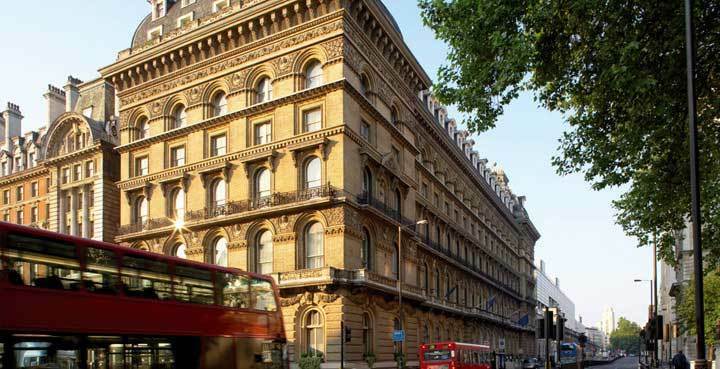 Built to rival the other big railway hotels at King's Cross and Paddington, the Charing Cross Hotel was designed with an ornate frontage in the Franco-Italianate style. In 1865, the Midland Railway Company decided to get into the hotels game. 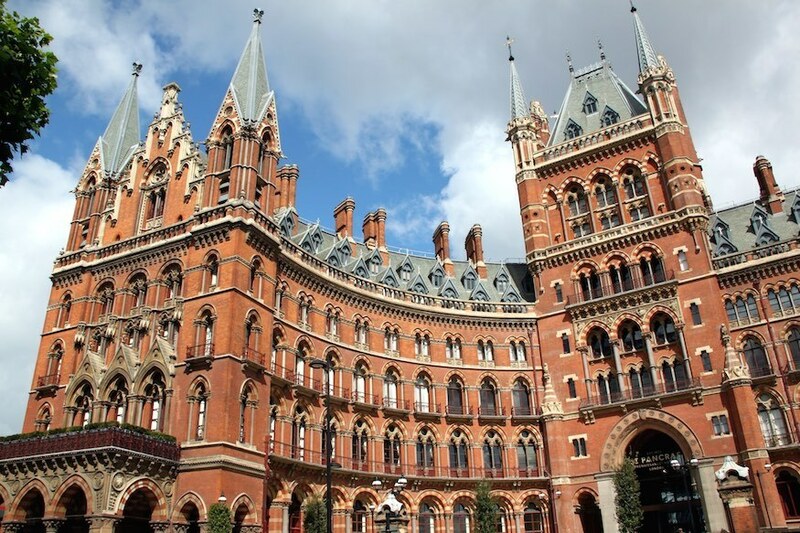 They hosted a competition for a 150-bed hotel; George Gilbert Scott's design won over the judges even though his building had 300 beds — twice the original spec. The resulting Midland Grand Hotel, was, indeed, grand. As well as an incredible staircase, there was gold leaf on the walls, and every room had a fireplace. In addition, there were innovative hydraulic lifts, concrete floors and revolving doors. But, as it wasn't seen as necessary at the time, none of the rooms had bathrooms. St Pancras Renaissance London Hotel, formerly the Midland Grand Hotel. By the 1930s, the building was too outdated to run as a hotel. Instead, it was used for rail offices. It took a lot of time and money to restore the building to its former glory. 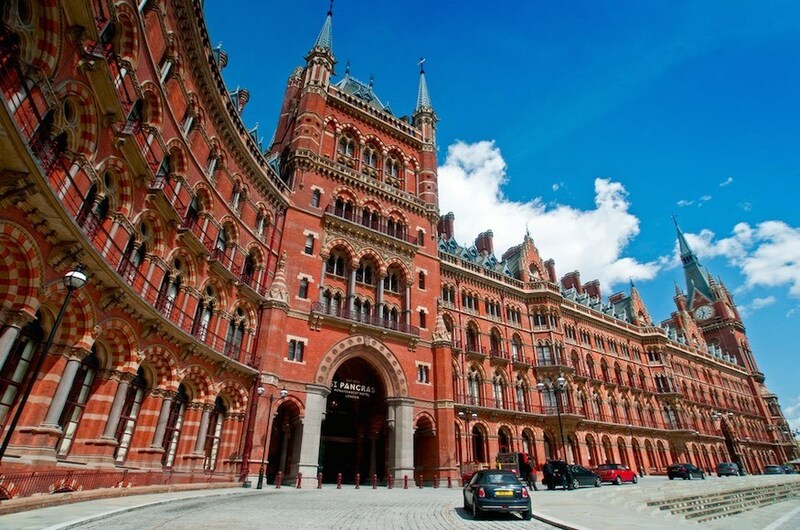 The redeveloped hotel, renamed the St Pancras Renaissance London opened in 2011, with 244 bedrooms, two restaurants, two bars, a leisure centre, ballroom, and 20 meeting rooms. Barry's back! Yes, the Great Eastern Hotel is another railway hotel designed by Edward Middleton Barry, this time in conjunction with his brother, Charles Barry Jr. It was completed in 1884, after Edward had died. Andaz Liverpool Street, formerly the Great Eastern Hotel. The last on our list is the Savoy Hotel, which opened on 6 August 1889, with many claims to be Britain's first 'luxury' hotel. The Savoy. Photo by Francesco Camardo. As well as electric lights throughout the building, there were also electric lifts, and en suite bathrooms in many of the 286 rooms, with hot and cold running water. The hotel is now a Grade II listed building. 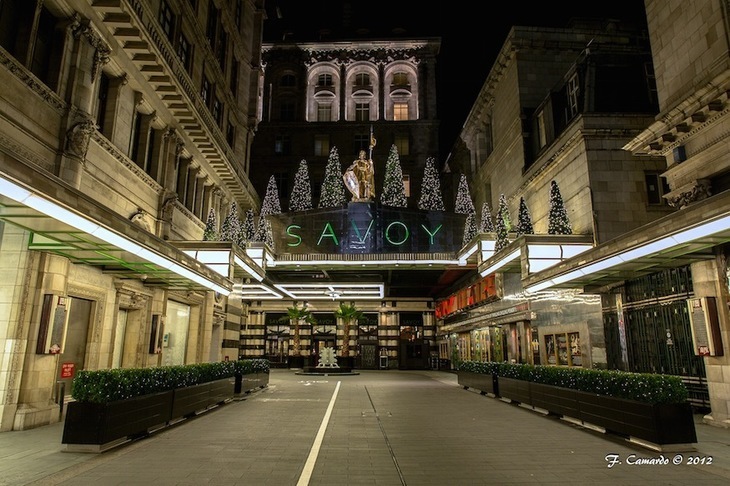 Read more secrets of the Savoy here. In just over 50 years, London's landscape had been transformed by this handful of hotel buildings; it's intriguing to think how these hotel's technical innovations and social developments have changed the way we live today.